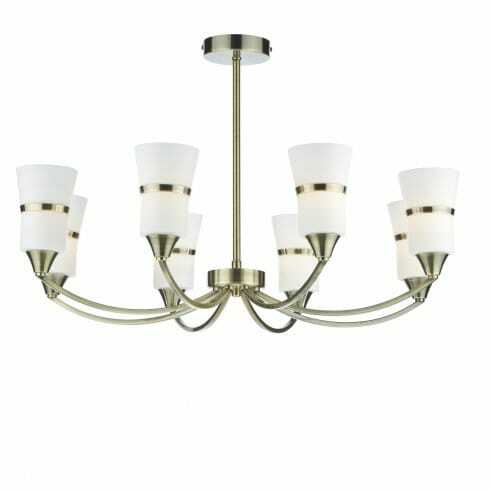 Dar Lighting Dublin large 8 light ceiling fitting features eight bowed, opal glass shades each with a central band of antique brass that compliments the rest of the metalwork. The combination of textures and the simplistic style of the frame creates a contemporary look with a slight classic twist. The product code for this Dar ceiling fitting is DUB0875/LED. Subtly decorative and packed with style, this fitting will certainly add a touch of modern class and charm to your home. The fitting comes complete with LED lamps that offer bright, very long lasting and energy efficient light. Also available as smaller sized 3 and 5 light semi-flush ceiling fittings, or as a matching single light wall fixture. Alternatively, please continue to browse through our large online catalogue for further inspiration.